It is not unusual for our family to hear the first knocks on our door around 6:00am. When we first moved here I can tell you that it was definitely shocking for me. But then again at that point and time I was just also being introduced to the town announcements at 5:30am. Needless to say I have gotten used to both of them and now expect each to happen right on schedule. The knock on our door at 6:00am February 11th was much different. This time it was from our little nine year old neighbor Stiven. Stiven has been a staple at our house since we moved to Caspizapa. Stiven, Erick, and Jhordan were the first boys that made friends with Malachi. They have become a part of our family. That morning Stiven was very upset. He was speaking so quickly about his mom and the baby. All I could make out was my mom and the baby are bad. We knew Keisy was pregnant. We were very excited when she shared the news with us. She is a beautiful pregnant woman. Her growing belly and joy for the life growing inside her was present when you looked at her. Something had to have happened because she was still a month out from the due date. I walked over to Stiven's house to speak with his grandmother. Obviously something was wrong and Stiven was begging for help. Neddy shared that Keisy had to go to the hospital early to have a c-section. There was a complication and now both her and her little son were not doing well. The hospital was an hour and a half away and she wanted to know if we could go and visit with her. She wanted to see if we could find out more about her little grandson and if he was going to survive. Visiting hours are from 2-4 only and now all we could do was wait. Those next hours seemed to drag on forever. We arrived at the hospital at 3. Only I was allowed in. Taylor waited patiently outside with all of the kids. Praise God for some quick thinking- a bag full of snacks to help keep everyone at bay. I was ushered in down the hall where I found Keisy waiting on a bench. 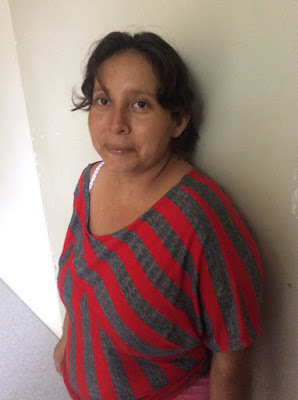 She was waiting to see her son Ascencio and to talk with the doctor about his case. As we waited for the doctor I listened to what had happened. Keisy went into preeclampsia. She was rushed by ambulance to the hospital. She said she was in so much pain that she thought both of them were going to die on the way to the hospital. She described needing the emergency c-section and the look in her eyes was heartbreaking when she said Ascencio was purple when he was born. She thought he had died. I encouraged her to take comfort in the Lord because both of them had life. God saved her through the c-section and now we need to trust in the Lord for Ascencio's care. Visiting hours were completed at 4. The security guards were starting to usher everyone out. We had just been informed that Ascencio needed more tests and he was having a very difficult time breathing. I reassured Keisy to trust in the Lord and promised I would return tomorrow. Friday was Anthony's 4th birthday! We celebrated bright and early. What four year old can wait for everyone to wake up? Not this one. Birthday cake and presents. Can you think of a better way to celebrate your birthday? Anthony couldn't! I spent the morning prepping lunch, dinner, and snacks for Taylor. I was going to Tarapoto without the rest of the family. It was the first time for me to go out all day as a missionary without my family. Needless to say I was absolutely terrified by the thought but my excitement was building. I hitched a ride into Picota on a moto before finding a taxi heading to Tarapoto. We made a quick stop off in Pucacaca to pick up Faith and away we went. Faith and I arrived at the hospital just as the doctor was finishing his morning rounds. Keisy was being moved from the room she shared with four other women where she had a bed to the lactation room. This room is where women stay when their babies need to be in the NICU. Here they had three beds and three mattresses laid on the floor. Keisy was moved to a mattress on the floor two three days after having a c-section. This room was not filled with the joy you expect to see with new mothers. All of these women were here together because their baby was fighting for life. The worst part was that if your baby was too weak or unable to nurse you expressed your milk and passed it through a window hoping to catch a glimpse of your child. We learned that Ascencio was not eating. He was still having a hard time breathing. But his color had improved. He was no longer purple. His cheeks were now red. Praise God! The doctor gave us the list of medical supplies needed to treat Ascencio and away we went to purchase them. We also purchased Keisy some pain medication since she was no longer being treated at this time and she was obviously in a lot of pain. When we returned later that afternoon we learned that Ascencio had started coughing up blood. As you can imagine this brought many scary thoughts to the family. The doctor also said that there was a murmur and he needed to see a specialist ASAP. Mom mode kicked in. What happens next? How do we get to the specialist and when? We headed to the clinic to schedule the appointment. We paid for the consultation and the appointment was only two hours away. Praise God! Next we headed back to the hospital to start working on the arrangements to bring Ascencio to the clinic. At this point we learned that we would not be able to use the ambulance to transport Ascencio. We would be taking a moto from the hospital to the clinic. Yep that's right a moto. The nurse had this precious baby boy wrapped in her arms as we drove across town on a moto. Something I never expected to ever see but will not be surprised if I ever see it again.The specialist spent the next half an hour examining little Ascencio. At the end of the appointment he said that his heart was perfect. Praise You Jesus! God granted me another day to visit with Keisy and Ascencio. On Saturday Andrea went with me to visit. When we arrived we received more good news. Ascencio had stopped vomiting blood. He still needed medications to help with his breathing but they were going to try to offer him some milk. As Andrea and I left to purchase the IV bags and medicine we were singing praises to the Lord. We also purchased some items for Keisy to clean her incision. Some things I completely forgot to purchase for her the day before. During these three days I fell more in love with God. I was able to witness Him in so many of His hurting children. He blessed me with many opportunities to comfort Him and pray with Him in ways I had never expected. I am humbled that God called me to do this and I look forward to being with Him again soon where He is sometimes forgotten.